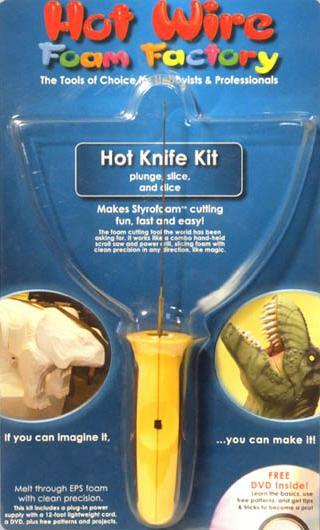 Crafters Hot Knife Kit - Dino Rentos Studios, INC.
Plunge, slice, and dice foam like magic! AC plug-in-the-wall power supply, Hot Knife, Instructional DVD with bonus featurette: Making Tombstones(featurette is a $9.95 value). Comes with 12 feet of tool cord! The foam cutting tool the world’s been asking for. A combo hand held scroll saw and power drill that cuts foam with fast clean surgical precision. The 4” blade is made from thin tough steel, with a unique round shape that slices quickly and cleanly in any direction like magic. Now comes with a handy slide switch right on the handle. The DVD takes you through all the basics of Hot Knife cutting, plus tips on foam gluing, and painting. The bonus featurette, Tombstones, is a 30 minute step-by-step instruction on how to make a great looking spooky tombstone. Tombstone pattern is included!